When I first started kegging, I soon realized how much simpler taking beers to parties would be. I’d take ONE big container of beer, and dispense it. No more super heavy coolers of glass beer bottles to lug over and bring the empties back for cleaning and reuse. 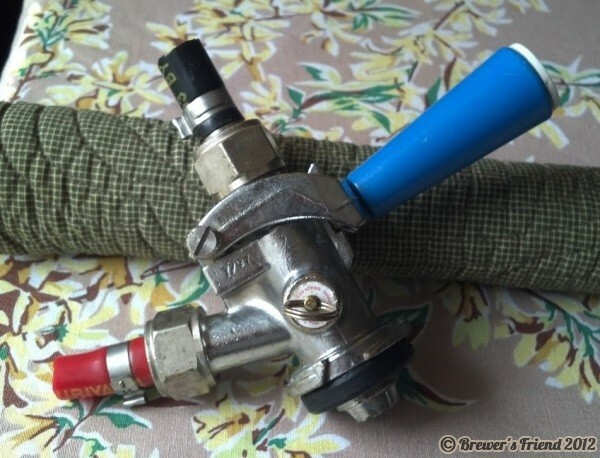 Until this fall I’ve been using a picnic tap to dispense my kegged beer when I’m away from the keezer. I have used a big metal trash can lined with a contractor-grade extra thick trash bag to hold the keg(s). I pour ice ½ the way up the kegs to keep it at dispensing temperature. If I’m only using one keg, that’s a lot of ice (30 or more lbs) to get the keg properly surrounded with ice. We have a big party at our house to celebrate Fall. Typically we have 60-70 people show up. We kick 2 corny kegs of beer and most of a keg of root beer. I had wanted a better way to dispense the beer, and had been using a Craigslist trawler for months to see if I could find an appropriately priced jockey box. After about 8 months of waiting, I scored a major Craigslist deal on a 2 tap jockey box that was set up for commercial Sanke kegs. It was a plate chiller type, and happened to be a 3 beverage chiller with only two taps being used. It included a 20lb C02 tank (almost full! ), regulator, jockey box, blue tub, an empty pony keg shell, and extra fittings. Basically it is an Igloo cooler that has either a cold plate or a stainless steel coil inside. 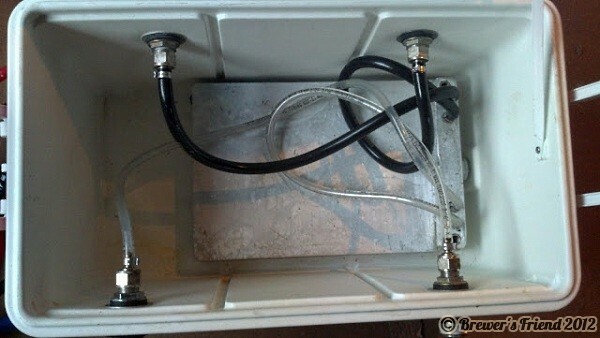 The plate/coil is surrounded by ice and as beer passes through the plate/coil, it is chilled to serving temperature. The keg of beer need only be kept at about 50-60 degrees – the jockey box will take care of the last 10-20 degrees. On a hot day, that is a big savings of ice! It is also convenient because you can provide taps to make serving easy. It’s a great way to serve a lot of beer with less ice, and elevate the taps a bit to make serving more convenient and potentially less messy..
With a small investment in plugs for the 3rd beverage openings and replacement fittings for corny kegs I’d be ready for our big open house, Thanksgiving, New Years…well, you get it. Any party in the future. I got the fittings from my LHBS. On the outside corners of the plate you can see the unused 3rd tap. The plate is aluminium on the outside, and it encases stainless steel tubing on the inside. It’s surprisingly heavy. Warm beer goes in the clear tubing, passes through a lot of stainless steel tubes inside the plate, cools off, and comes out the black tubing to the tap. I also needed to plug up the 3rd beverage pass so that it would stay unspoiled in case I wanted to install a 3rd tap someday. 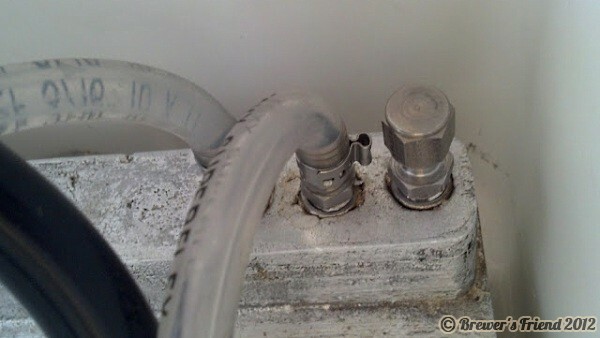 In the picture above, the two tubes are the warm beer input tubes, the outside the the 3rd beverage plug. When using a plate type jockey box, you want ice to cover the cold plate, but you DO NOT want the plate submerged in water. A coil jockey box can be submerged in water, but not a plate. Always keep your Igloo cooler drain open if you have a plate. You can see the grey bucket to the right of the box on the floor to catch water draining out of the cooler. After replacing the fittings to accommodate corny kegs, I thoroughly cleaned all inputs using Beverage Line Cleaner (BLC). I did a quick test the week before the party to see what pressure delivered a good pour. It was different than my picnic tap. The jockey box worked great at our fall open house and Thanksgiving. We’ll use it late this year for another gathering. Better serving arrangement. We had almost 70 people at our fall party. Having taps made it quicker for people to serve themselves. It also made for a consistent and beautiful pour – since the taps were stationary and weren’t being moved around like a picnic tap, I could truly set it and forget it. Less wasted beer from foamy pours due to people moving the picnic tap or being tempted to mess with the pressure, etc. It looks more neat and finished, and I think it generated less mess. The box is surprisingly heavy. Not awful, but it isn’t super light. You still need to bring CO2 with you to dispense. If it is hot, you still need to chill the kegs some. You need to use BLC to clean the lines after use and before storage. Next I’m going to experiment with a paintball can adapter fitting to see if a canister can push a keg or two. That would make it so much easier – no big CO2 tank to lug around, and the paintball can and the regulator can sit in the cooler for transport. Also, it’s important to run beer though the lines and out the tap BEFORE putting ice on the plate. If you used water to clean the lines or water with BLC or similar in it, you might freeze up the BLC in the plates and you wouldn’t be able to serve until the iced BLC melted back to liquid. The order is: drain cleaning fluid/water from you lines and out the tap until you see beer, add ice to plate/coil, and serve. It was a great buy and it made our fall gatherings easier to host. If you have a lot of parties or attend parties and need to serve a lot of people, a jockey box might be a good alternative. Who knows – you might score one on Craigslist like I did – good luck! 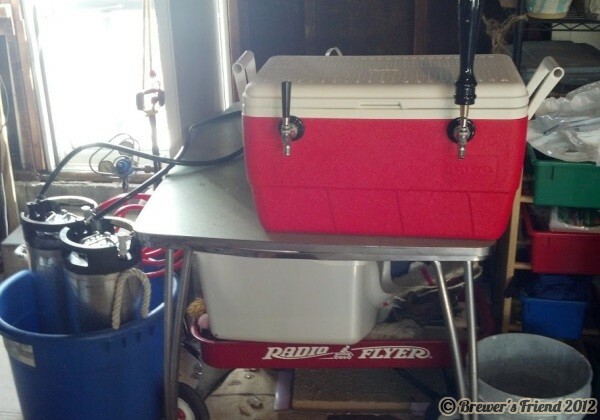 Craigslist is a great spot for like new brewing or serving equip. Northern Brewer or even your LHBS should have hookups for co2 cans as you are discussing. Look real simple. Pop right on a corney keg. 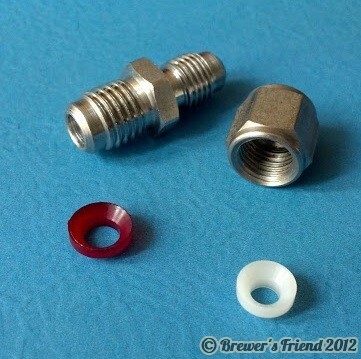 I am wondering where you got your cold plate flare fittings and what size they are? I have done 2 all-grain batches, one IPA and one Imperial Stout. This weekend I am going to make a Wit, a Bitter and one Imperial IPA. want to do that. I think it also look cool with real crown caps 🙂 Sure I have to clean them and fill them but I love this process. I make “small” batches so I bottle 20-40 bottles from eatch batch.